Soon, Jim will be serving in the upper echelons of a federal department. Jim’s transformation from Trump basher to one basking in Trump’s warm glow is not uncommon. Many conservative Christians have made the transition from critics to enthusiastic riders on the Trump train. But they still need to know when to pull the emergency brake. Jim arrived at this point the way many Christians who voted for Trump did. After the convention came a barrage of posts about what was wrong with Hillary Clinton. Eventually Jim shared a piece entitled, “After much prayer and soul-searching, I have reluctantly decided to vote for the Trump-Pence ticket. Here’s why.” It pointed to the GOP platform, to Mike Pence, and to the alternative. I get why Jim voted as he did. Hillary Clinton was unacceptable. Living in a swing state, Jim didn’t have the luxury of casting a protest vote, as I did in “safe” Texas. And I will admit to being more happy than sad myself when Trump pulled off the improbable. Responsibilities to the country and to its institutions transcend any one man, and any four year span. President Trump has achieved some important victories since taking office. There’s the appointment of Neil Gorsuch to the Supreme Court and foreign aid money won’t be going to abortion backers anymore. Just imagine what else could happen with a little focus and discipline. But the president has consumed trainloads of of time, energy and political capital on petty fights with the media. Is this really the highest and best use of his time? It’s almost as if he wants to derail his presidency when it’s barely left the station. It’s time for all those who are in the Administration and all those who have supported the President to seriously reflect. Responsibilities to the country and to its institutions transcend any one man, and any four year span. At what point should political appointees put the White House on notice that either the Twitter device goes or they do? And what of his supporters outside government? Barbs from his ardent critics certainly won’t persuade him to change course; but perhaps the voices of those once reluctant voters who put him in office can. 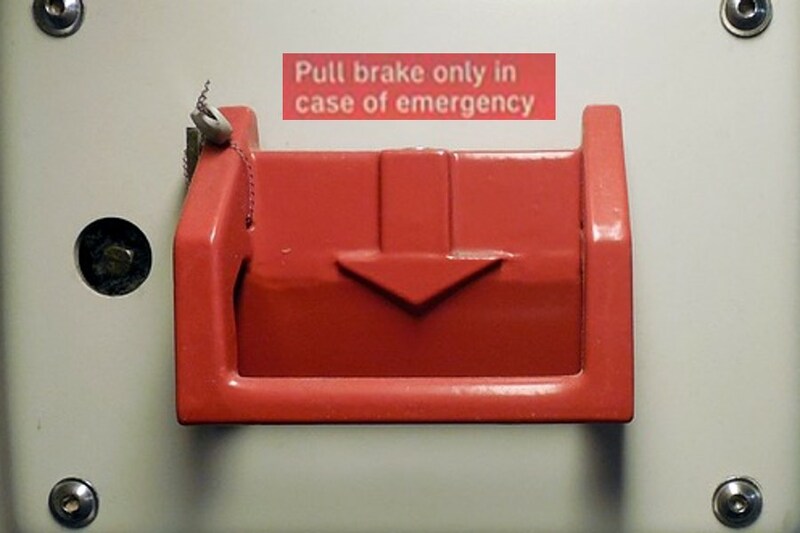 Time to Pull the Emergency Brake? Unfortunately, too few supporters seem willing to speak up. Instead, the President appears to be drawing many along with him who should know better. Trump apparently even asked his White House staffers what they thought of his “Morning Joe” messages. “Some praised the tweets,” reports the New York Post, while “others kept their heads down.” And so, partly because no one said what needed to be said, we now have the President of the United States of America sending around doctored WrestleMania videos. Sad. Instead of defending Trump’s latest Twitter rant, maybe it’s time to look back at our own words on social media. Has tribal loyalty bought our silence or changed our tune because “our” guy would get gored by the very standards we once applied? Has confirmation bias blinded us? Always applauding the engineer is not truly helping if the locomotive is headed down the wrong track. This train is set to run for another three and a half years. How far from our true home will we let it take us before we test the brakes and call for a course-correction? John Murdock worked for over a decade in Washington, D.C. He now teaches at the Handong International Law School, a Christian institution in South Korea. Absolutely idiotic. Inexcusably childish, this absurdity of an article. Stupid. Let me, with charity aplenty, explain why it is so criminally foolish. a. Anyone able to make a statement like, “If he’s going to call himself a Christian one day and call someone a bimbo the next or make fun of somebody’s menstrual cycle, it’s just beyond reason to me,” is in profound need of, like, learning how to be a man. Or does a Christian clutch his pearls when he hears something like, “As for those agitators, I wish they would go the whole way and emasculate themselves!” Sometimes the big kids say mean things, dude, even though Mom told us not to. b. Trump’s tweets are generally aimed at the right people for the right reasons and in the right measure. Which is simply to say: when someone is attempting to destroy the nation, a scolding is the very least that is appropriate. Unless you are an idiot, and then you might think it’s just too much. c. This is what fixing things looks like; this is how the instrument works. Get it? Lemme explain: if anyone has met soldiers, he will be aware that they tend to be a little earthy. Why is that the case? Because that’s how it is, that’s how people who want to be soldiers are. If you want to win a war, you need someone who can fight. People who know how to fight tend to be mean. Now, can we all please stop acting like eunuchs? Pretty please? Thank you, thank you, thank you. I am so tired of hearing that in order to be a “true” Christian, someone is supposed to act a certain way. People who push this meme are so tedious. The country was at a serious crossroad in 2016. It took an outsider who is sometimes crude to get the attention of the population. Thank God he did. BAM! Well said! So sick of Christians and their expectations! I’m simply a follower of the Way. Good grief! I’m sick of the new breed of pretending-to-be-Christians, I’m here to teach how to be a Christian. Murdock, I’ll be blunt. Go push a wheelbarrow someplace.